Our customers have been asking for it for years. … Get ready to glide down the cat litter aisle to pick up a bag of our Naturally Scented Multiple Cat Clumping Formula, the latest addition to the World’s Best Cat Litter™ family. 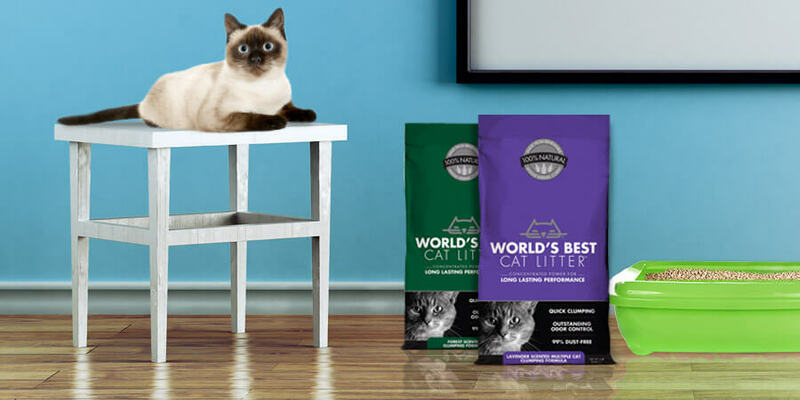 Scented with 100% all-natural lavender oil, this new World’s Best Cat Litter™ formula is a solution that should please cat owners and cats alike! Dressed in a black and purple bag, our new lavender-scented litter will hit the markets in May 2011, joining our Clumping Formula and Multiple Cat Clumping Formula on the shelves in certain locations. Our new lavender-scented litter is still made from 100% all natural ingredients. Lavender has earned a reputation for cleanliness, health and prestige. The name comes from the Latin root lavare, which means “to wash,” which may explain why you can find lavender in so many soaps! Lavender is also associated with relaxation, which is why it remains so popular in aromatherapy. Other sources say that lavender helps reduce stress, anxiety and insomnia. Clean. Relaxed. Sleepy. That sounds like a lot of cats we know too! Let us know what you think by leaving a comment below. We hope you’re as excited about a new lavender-scented World’s Best Cat Litter™ formula as we are.